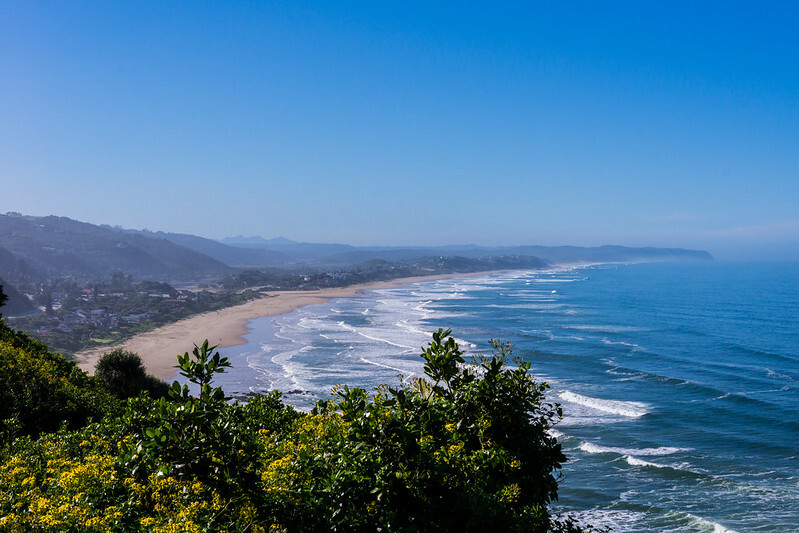 For years, I have wanted to do a road trip along the Garden Route of South Africa, but it had always gotten away from me. I would plan these week+ long trips out in 2013 and 2014 and each time I would find myself choosing a different adventure to a different place. 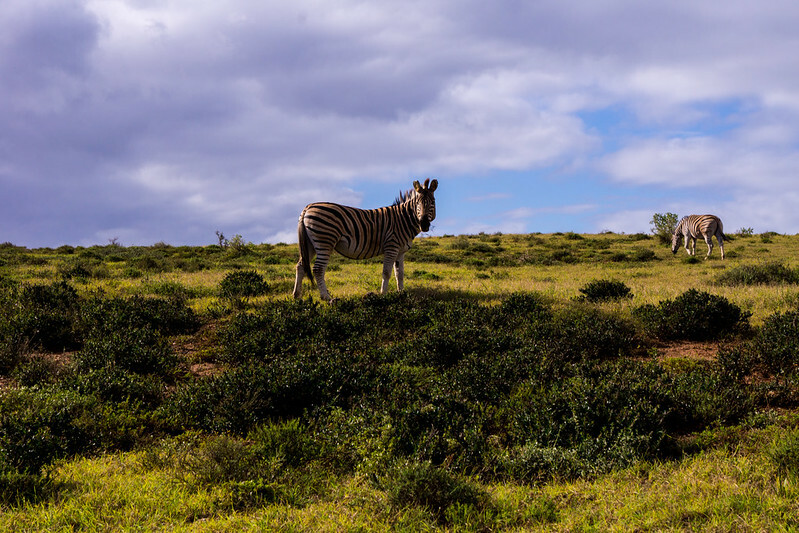 When I started planning my RTW itinerary I knew that now was the time to make this happen and check out the scenic landscapes that are offered along the stretches of highway in Southern South Africa. The Garden Route seems to have slightly different start and end points depending on where you look it seems, but for the purposes of my write up, it’ll mean from Port Elizabeth (in Eastern Cape Province) to Cape Town (in Western Cape Province). Typically from what I can tell it also means typically traveling along the N2 highway, which I largely did save for a few deviations to get to some points of interest. Considering everything that I was doing, this was a lot to cram into just a few short days and it was a lot of driving. But there was plenty of reward when it came to the sights and experiences (both good and bad!). Having just arrived in South Africa (Johannesburg) the night before I took the early morning British Airways flight down to Port Elizabeth so that I could hit the road early. Luckily the flight was on time and I was able to schlep my bag over to the Hertz office to pick up the car I had booked only a few days prior. So, let’s go ahead and caveat something here: I’ve rented a lot of cars in the US before, but had never rented in a foreign country. This was going to be a first for me! I will say that the process was very much the same even with the local Hertz branch being run by a franchisee, with the only downside being that my Hertz Gold Plus President’s Circle didn’t seem to do anything/mean anything here. 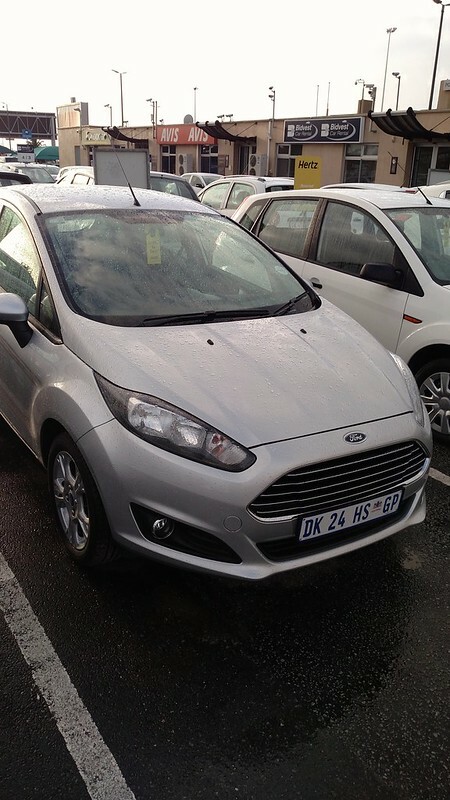 I filled out the forms, declined the tire and windshield insurance (note to self, you may want to get this…) and was given the keys to my car, a Ford Fiesta hatchback. Everything seemed to be in order, so off I went! Aside from almost going the wrong way into a roundabout leaving the airport, driving on the “wrong side” of the road, really wasn’t that bad. A few wrong turns were made, but I chalk that up mostly to Google Maps. 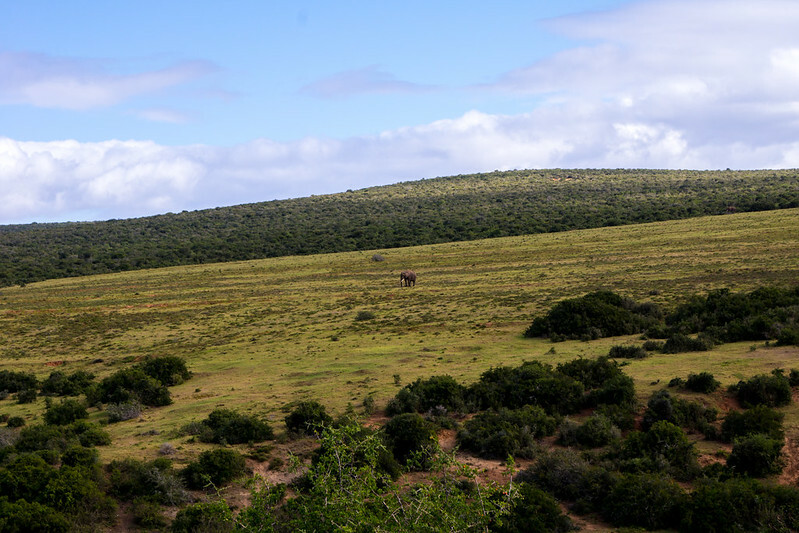 And speaking of Google Maps, when I first plugged in “Addo Elephant National Park” I had not paid attention and it took me East versus North to a southern entrance to the park that surprise, was closed. That meant turning around, trying to figure out how to get on the appropriate route without taking anything that was too much of a back road. 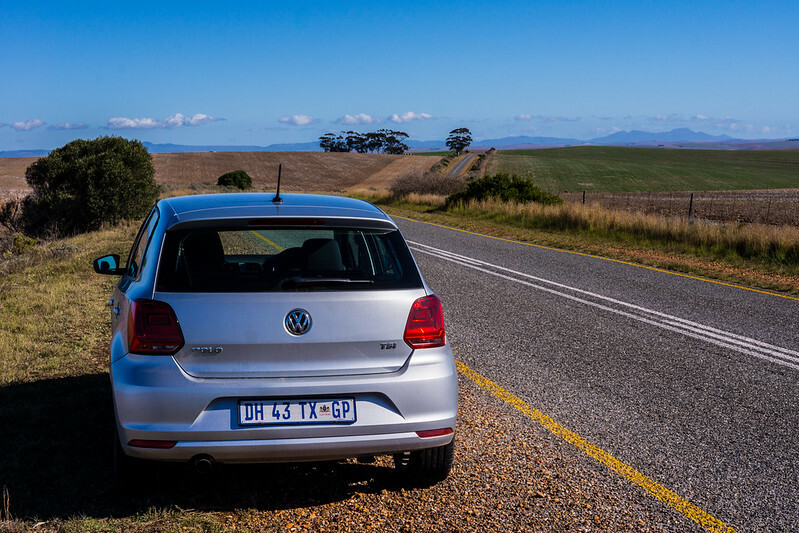 Going back towards Port Elizabeth on the N2, I was thinking to myself, “Wow, the roads in South Africa aren’t as bad as I thought!” Then I found myself on the back roads and rural highways. 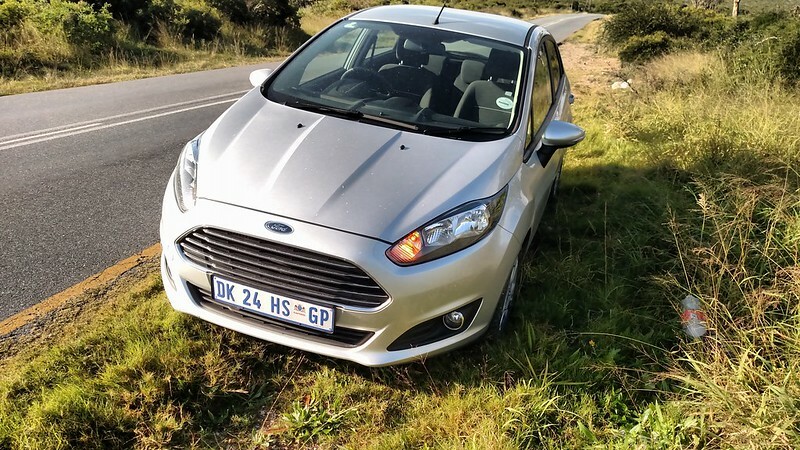 So, after first getting off the N2, I found myself on a back road that was absolutely fun to run the Fiesta on. No other traffic, narrow, and a bit hilly with a few turns. But it didn’t last long until I was on the R335 which would take me to Addo. Well, let me tell you about the R335 first of all. It’s heavily traveled by everything from cars to huge semis. It has a 100 km/h speed limit in some spots. It isn’t very well maintained and has zero shoulder (or less!). Most of you can do the math of that formula and know that these things don’t add up to anything good. 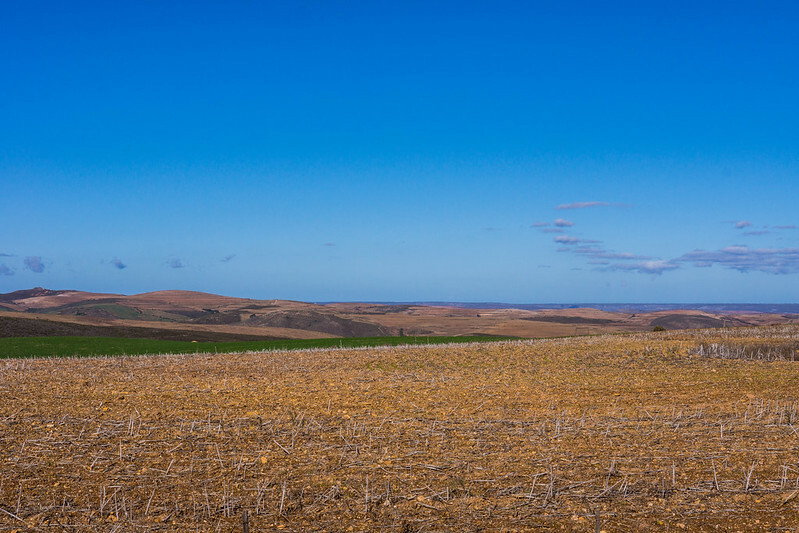 Well, for me that meant at about 6km north of the last cross street north of Port Elizabeth, as I came around a corner (driving at maybe only 60-80 km/h because the road was sketchy), a semi truck going the opposite direction had crossed over the center line making the curve. I had two choices, risk getting clipped (and since I was on that side of the car…) or try to go over on the shoulder to allow us to both safely pass. Well, I opted for the safe bet and my tire made contact with the eroding edge of the highway and I blew my tire. Essentially hitting a pothole at 80 km/h is not good! I immediately pulled off to the side of the road to see what had happened…and with my luck I couldn’t change the tire as the ground was extremely soft from having rained for the past week. My first two hours driving across South Africa and this has already going wrong! 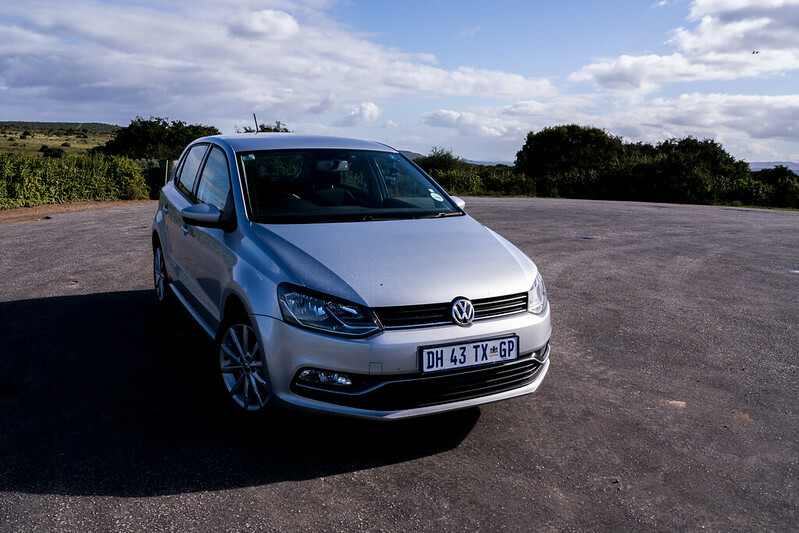 I waived the white flag quickly and called Hertz and arranged for them to bring a new car out to me and for them to tow the old car back to Port Elizabeth. It took about two hours, but they showed up I filled out the forms and then started wondering how much this was going to cost me. At least they were friendly about everything and then I was back off in a VW Polo hatchback. 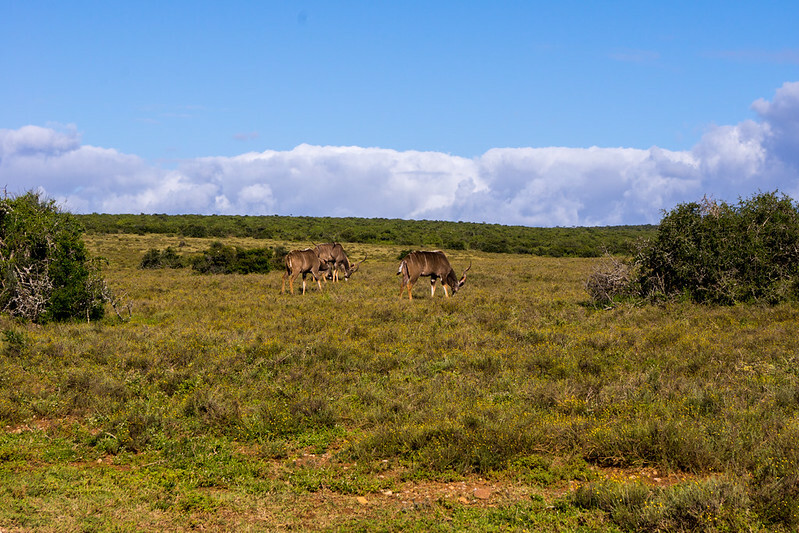 The rest of the drive to Addo was for the most part uneventful. Thankfully! 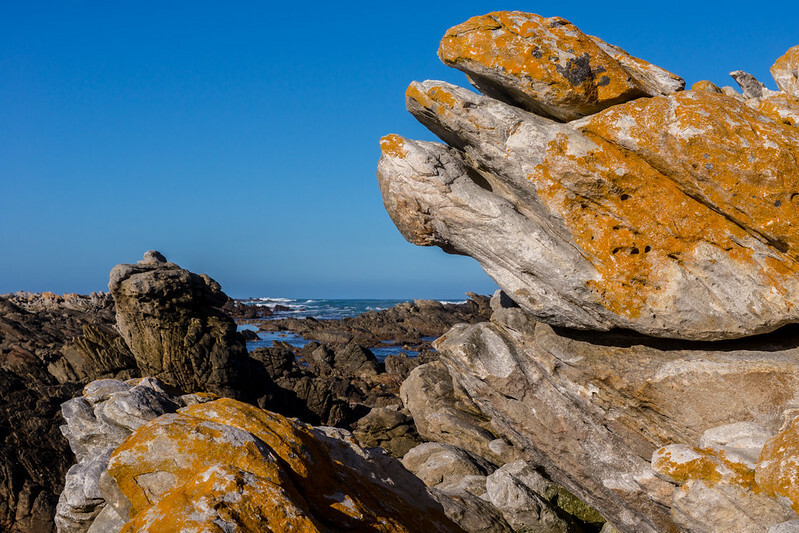 Given the proximity to Port Elizabeth, this is a very easy National Park to visit in South Africa if you want to see wildlife. With roads, both paved and unpaved, fanning out across the park you can see a great deal. However, don’t expect to see many elephants! During my visit here I saw just a single one all off by itself! Of course I was only able to spend a few hours here, so odds are there were many more just not in the parts I was visiting. Upon entering the park, you’ll have to pay a fee which is higher for foreign tourists. Shortly from there you’ll come upon the “Main Rest Camp” here there are facilities including a restaurant, gift/convenience shop, restrooms, fuel, camping, picnic areas, and everything else you would expect. You’ll have to go past another gate to get into the actual park, and they stop you here to check your paperwork that you got from the main gate and then you are free to roam about. 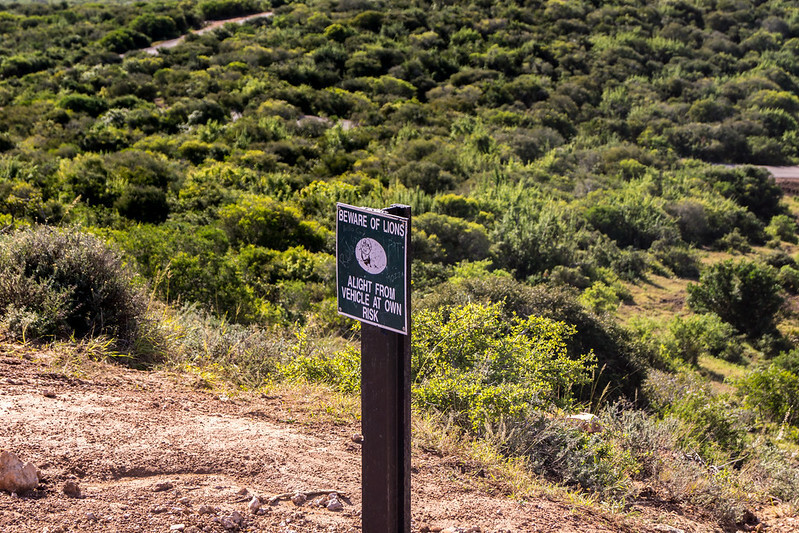 Since most of the roads are hard-packed graded dirt roads, it’s definitely worth noting that you probably don’t want to rent that Mercedes or BMW sedan if your plans include this park. While you don’t need four wheel drive or a truck or jeep, there were a few spots where it was definitely sketchy driving through and that was mostly due to the recent rains. Remember, if you are unsure about driving through something, you probably shouldn’t! Although, it is probably also not recommended to get out of the vehicle to gauge the situation either! 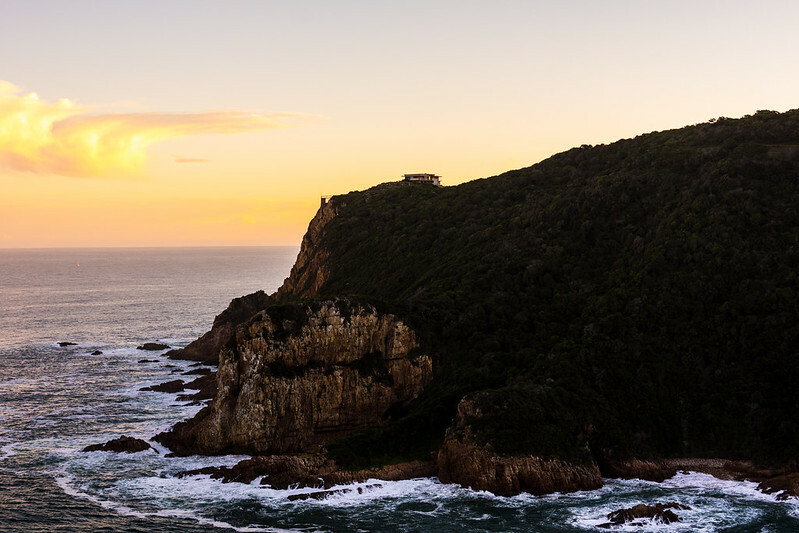 After stopping off at the main rest camp again on the way out, it was time to rush back down the R335 towards Port Elizabeth and start driving towards Knysna. It was already in the afternoon and I had wanted to try to make it there before dark. Especially considering how my first day of driving in Africa had already gone, I did not want to figure out driving at night quite yet. Google Maps put it at roughly 300km and a little over 3 hours, but knowing that it was winter in the Southern Hemisphere, it would be dark before I knew it. I started out heading back the way I had come back down the R335 and to the N2. Luckily my old rental car was no longer on the side of the road, so I took that as a good sign! Most of the journey would be pretty uneventful and wasn’t the most scenic leg either. As the N2 winded through the forests it went to and from four-lane divided highway and two-lane rural road. I stopped about an hour in and after being passed by a few bikers with Confederate-flag patches on their jackets (whom I would later see on the side of the road having been caught by highway police) at a gas station to grab a snack and drink and then kept on driving along. At this point it really was a race against the clock to beat the end of the day. It was already at the point of sunset where I needed to turn on headlights and there was still an hour to go on the road. It eventually did become fully dark about 20 minutes later, so the last 30 minutes or so were spent driving in the dark. 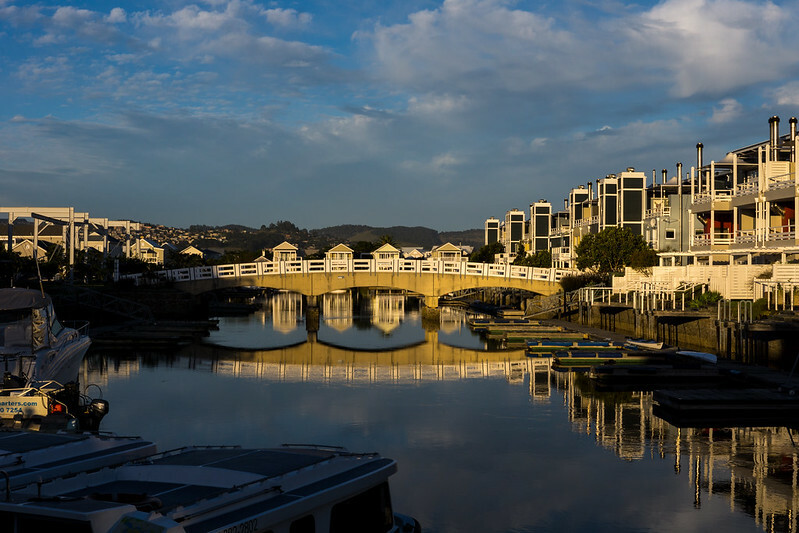 This wasn’t too bad, although given the location of the Conrad Pezula, going there for the first time at night could get you mixed up – you have to drive through a residential neighborhood and instinct tells you that surely a resort couldn’t be out that way. But surely enough and it is a fantastic property. 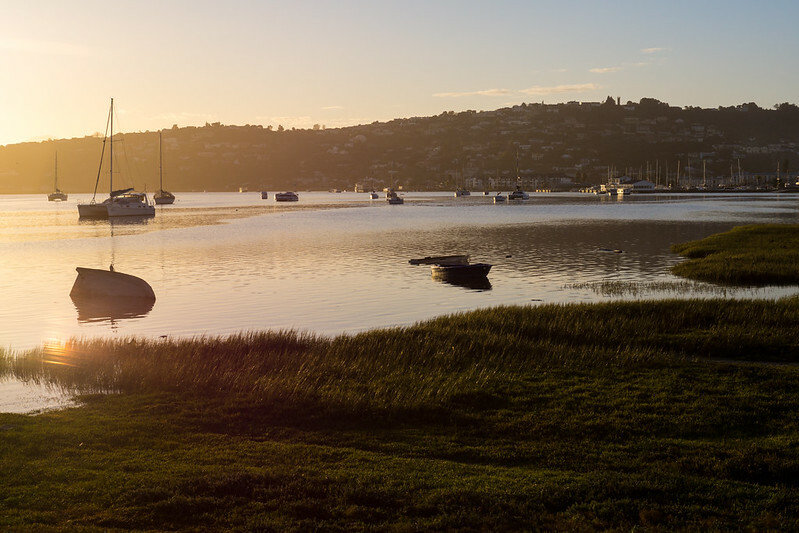 My first morning in Knysna was admittedly lazy, sleeping in until at least 9AM. Which was fine by me considering what the past 48 hours held – flying 9200 miles from Florida and driving nearly 400km. That’s a lot of ground in a short period of time and by the time I reached the hotel I had only been in South Africa for a little over 24 hours. 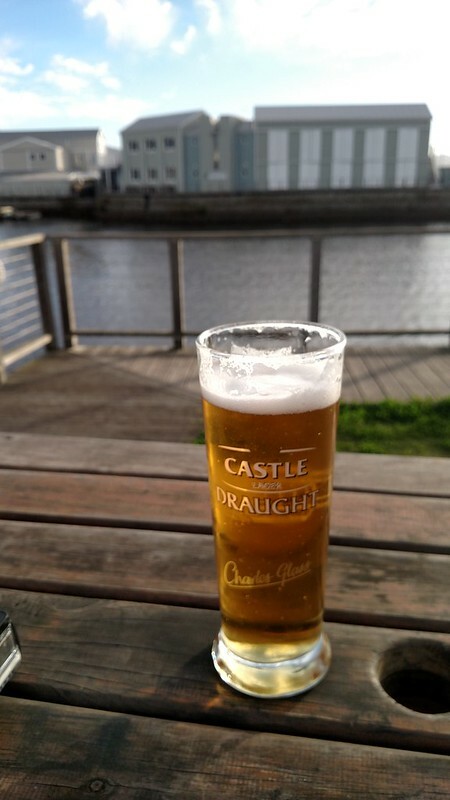 But that was essentially the theme for this trip (or all my trips, really), and thus my time in Knysna would be limited. I was lazy enough that I missed breakfast, so I opted to go grab lunch from Cafe Z in the main building before heading out. 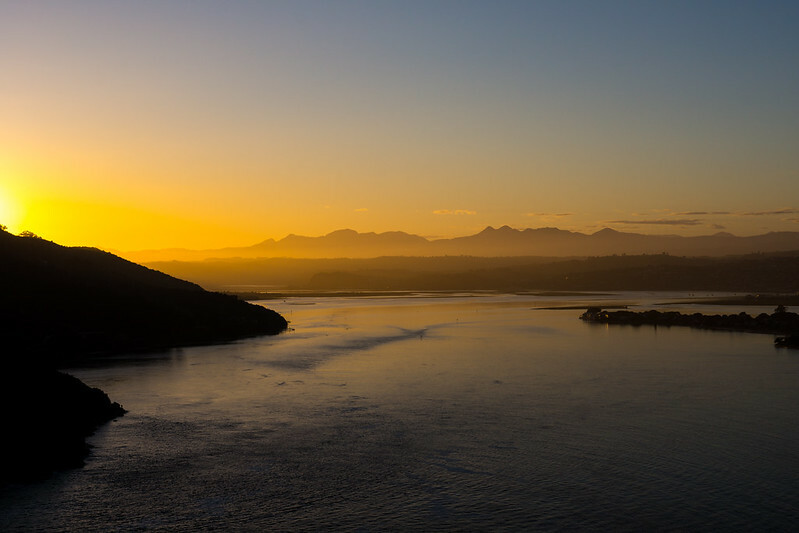 When I finished up there and then found out that I wouldn’t be able to rent a kayak at the beach (or canoe solo), the Conrad set me up at a place on Thesens Island in Knysna. Actually, they sent me to a bar/restaurant, which apparently is a chain, called Quay Four. There was a rental desk inside and they set me up at the very affordable rate of 100 Rand per hour (~$7). I went ahead an put down for two hours and then it was off to their dock for me to put in. I was given a quick briefing on suggested routes to take and what to do/not to do, and then I was off on my own. I started by going through the canals of Thesens Island, with all their very nice houses along the way. It’s pretty much the South African version of 30A on an island (30A being a coastaly highway in neighboring Walton County, Florida here in the US that is known for it’s little “towns”, new urban concept, and property values to match), so it felt a little bit like home there. It actually took a good bit to get through the canals since I had no idea where I would exit, but eventually I found my way out on the far side of the island. I could have turned back from there and made my way back to Quay Four, but I opted to the long way back around following the channel out into the lagoon, head south, reach the point of Thesens Island and then turn back North to the restaurant. I was the only kayaker out this afternoon, but plenty of people were out enjoying their boats. The only thing that sucked was that at many points it was definitely clear that I was fighting the current – and I was getting worn out appropriately so. I was originally going to float around some more and be a bit more meandering, but I was just too worn out to enjoy it. I paddled hard that last stretch in, pulled up the kayak and went inside to promptly get a beer. Actually, when you work that hard at it, something like a beer feels that much more rewarding! I sat outside watching the sun get low in the afternoon (which it was only mid-afternoon or so, but felt so much later!) while enjoying my beer and drying off. On the way back to the hotel, I made my way to The Heads, which is the entrance to the bay from the Indian Ocean. Each side consists of high cliffs with a narrow channel between. Being fairly high up means extremely great views looking back towards Knysna and out over the Indian Ocean. 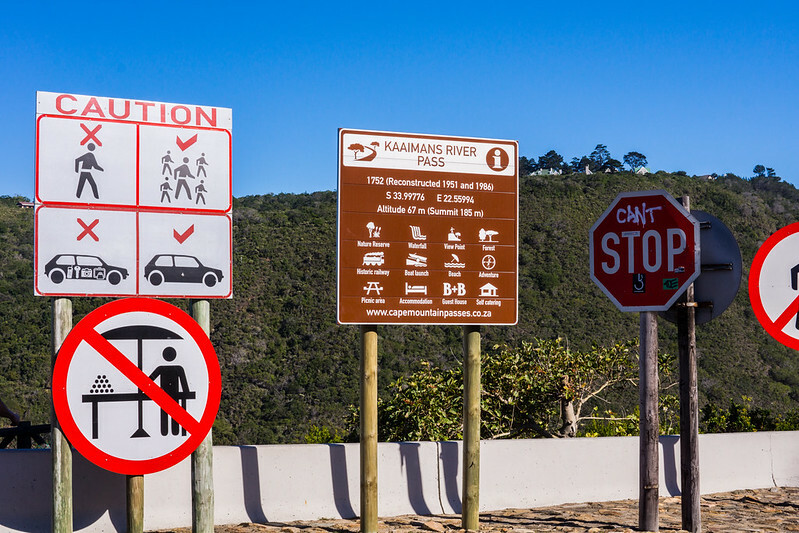 There’s a number of areas here where you can park and check it out – I had opted for the overlook, but if I had gone earlier I would have also gone down on the ocean side as well. What I can say is that it was a fantastic sunset from there! This is only a short distance from the Conrad, so less than 10 minutes later I would be back at the hotel so I could change before going back into town for dinner. There are a few restaurants down on the island; I had opted to go to Tapas & Oysters. There wasn’t any bar seating, so I found myself at the lonely table in the corner which kinda sucked. At least at a bar counter, you have excuses for interacting with others! 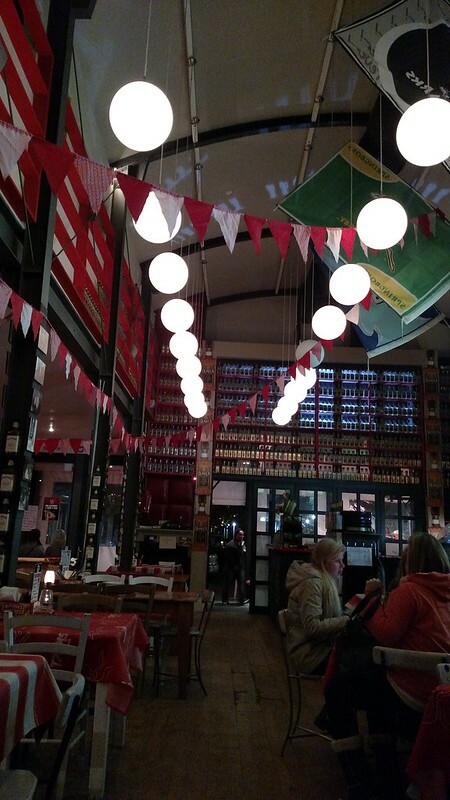 But, that beside I enjoyed several small plates and a few beers, which were all reasonably priced. 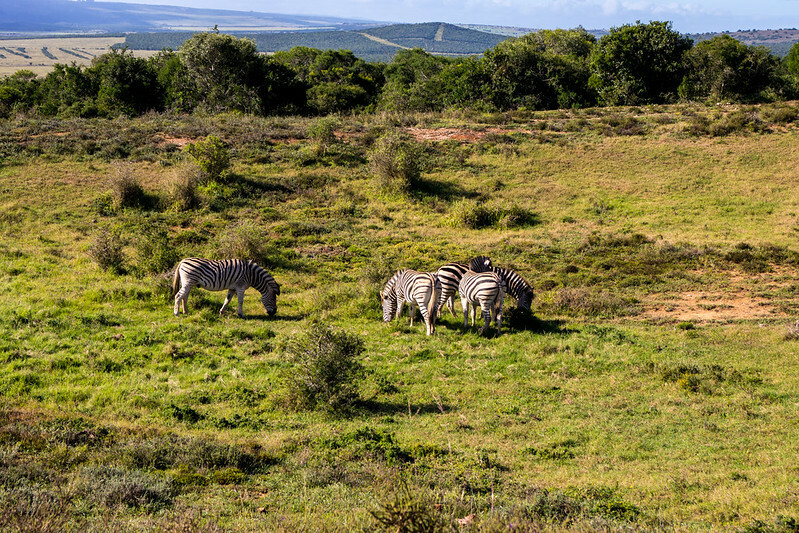 South Africa certainly is an affordable destination from everything I could tell. The highlight of the night was that after walking around the area, I got back in my car and headed back towards the Conrad. Of course as I came around the corner before the turn towards the hotel the local Police were running a checkpoint and I was flagged in. This though was completely professional interaction – they looked at my license quickly (which my Florida license alone was sufficient) and then wrote down the plate of my car before wishing me a good evening and sending me on my way. Surely it was a DUI checkpoint of sorts, because I can’t think of too many other reasons to have a mandatory checkpoint in the middle of town at night. Actually this was one thing I really noted across South Africa – local and highway police were everywhere. I’m honestly surprised that I wasn’t tagged for speeding by a cop at all during the time I was there. I mean I probably saw more highway cops in a few days in South Africa than I had seen Florida Highway Patrol Troopers back home on the highways in the 6 months leading up to my trip. To be honest, I didn’t really “Explore” Knysna. I was here for just one short blip it seems and I never really got to “take it in”. It was a good pit stop and to be honest I think the South Africa leg really was about the drive versus any place I stopped along the way. This would be the longest stretch on this road trip and would definitely take me through some incredibly scenic areas! 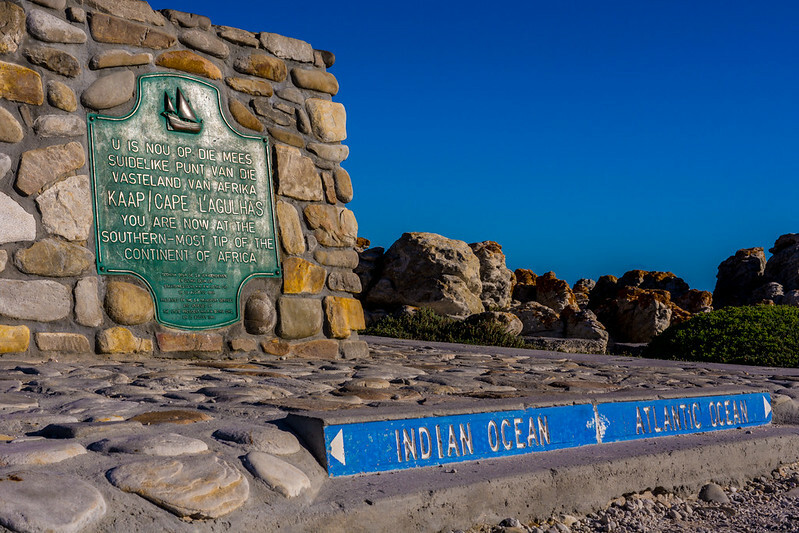 Although the distance to Cape Agulhas was the same as my Port Elizabeth-Addo-Knysna drive, there would be the leg from Cape Agulhas to Cape Town that would just add on to it. And of course starting later than I had wanted to, meant that it was going to be a long day. 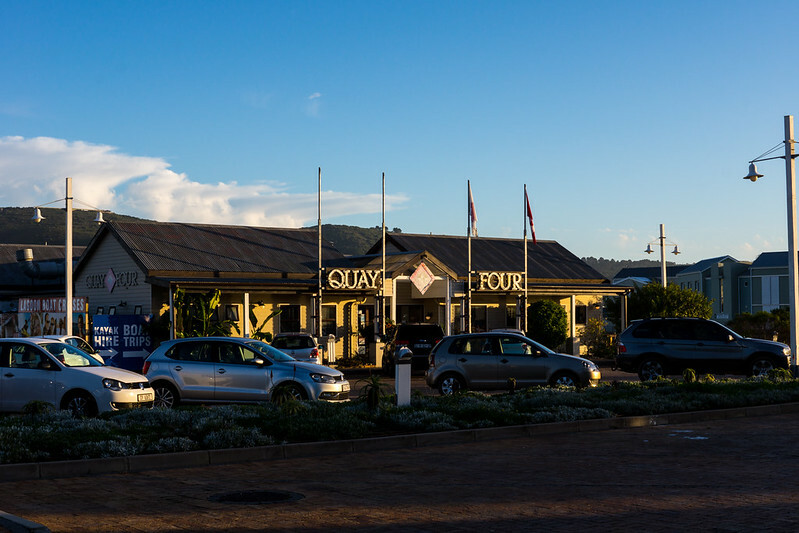 Leaving the Conrad, I fueled up on the center of Knysna and immediately started driving. The first while was absolutely beautiful coastal driving before transistioning to forests. From there I entered the hilly plains which was beautiful in a different way. I pretty much kept driving without really stopping other than for a quick snack, drink, and restroom break in the small town of Riversdale. I kept on plowing along, avoiding the highway police and eventually turning off of the N2 to take the R319 towards Cape Agulhas. Admittedly I almost missed this turn for some reason, but the drive from here was much, much more enjoyable than driving the N2. For starters, there was hardly any other vehicles out here at all; the roads were a little hilly, but otherwise straight; and you were going through the now empty farm fields. I got out at one point and was amazed at actually how quiet it was out here. I mean, absolutely still. 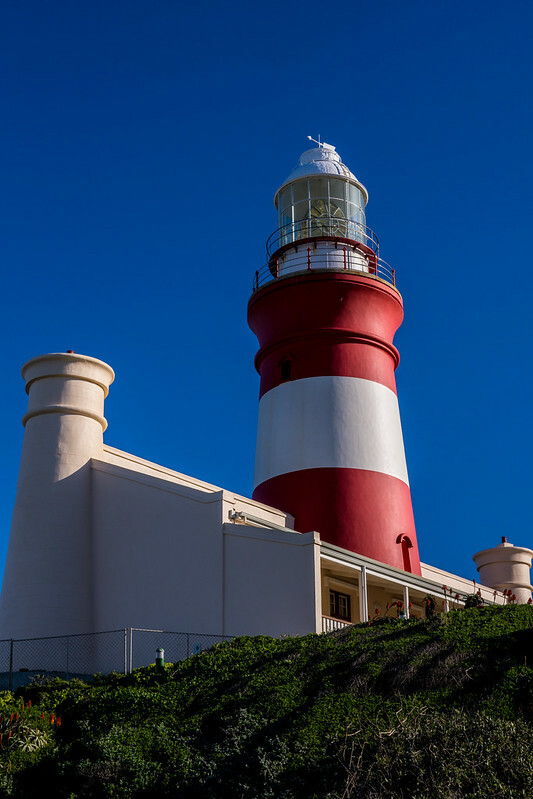 You go through a few small towns on the way to Cape Agulhas, including L’Agulhas. Google Maps again led me astray here taking me on to some residential back roads which turned out to be the “center of town.” Note to anyone else, make sure to specify the lighthouse (or just use common sense). Driving past the lighthouse the road turns to dirt and you’ll eventually find a parking area where you’ll have to “offroad” a bit. 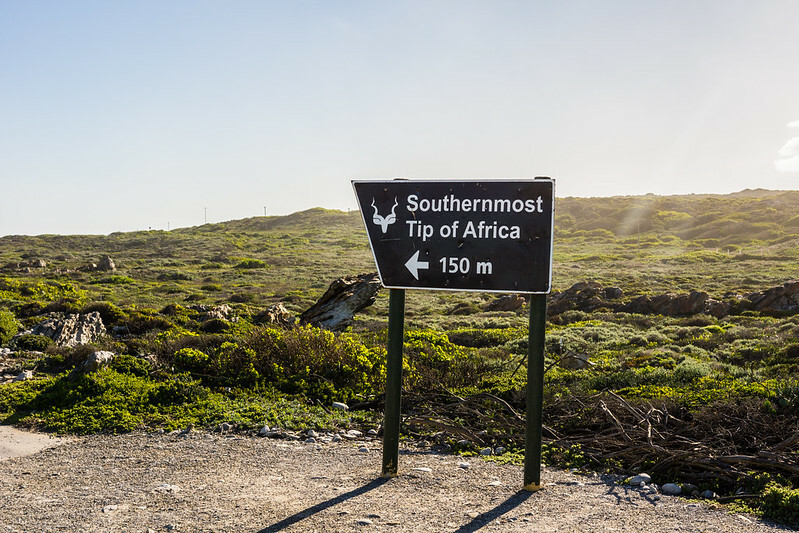 From this parking spot, it’s a short walk until you reach why you are here: The Southernmost Point of Africa. This is where the Indian Ocean and Atlantic Ocean meet (although they complete with the Cape of Good Hope for this distinction), but if you are thinking that you’ll be able to stand with one foot in each ocean (like I did) you’ll be disappointed. It’s a naturally rocky point, and I guess if you ware willing to scramble over the wet rocks south of the marker, then you could, but I wouldn’t recommend it. I did do a little bit myself, but didn’t get out to the end by any means. Keep Going South And The Next Thing You’ll Hit Is Antarctica! It was a good spot to sit and reflect though for a minute. The area is beautiful and almost a little alien in appearance. I really wish I could have had a little time to hike around on a few of the trails, but even after 30 minutes or so I had to get back on the road to ensure I got to Cape Town by nightfall. 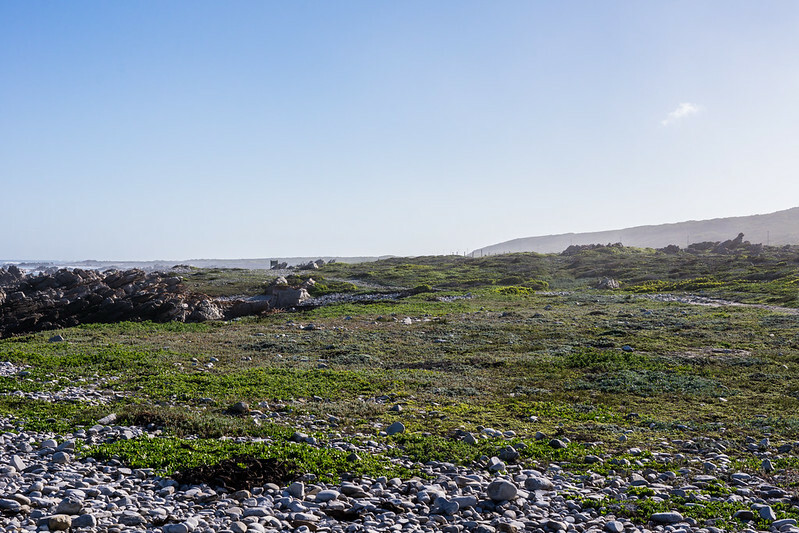 I had originally planned on driving next to Betty’s Bay for the Penguin colony that lives there, but due to the late point in the day, I knew better. I focused on hauling towards Cape Town, 225km and 2.5 hours away. Luckily, I made up down in the urban extent of the Cape Town metro by night fall, coming down through Sir Lowry’s Pass on the N2. Traffic in Cape Town and the suburbs wasn’t as bad as I had expected and I made it to the Westin Cape Town by the Convention Center in the middle of the city in good order…and with the last little remnants of light in the sky! 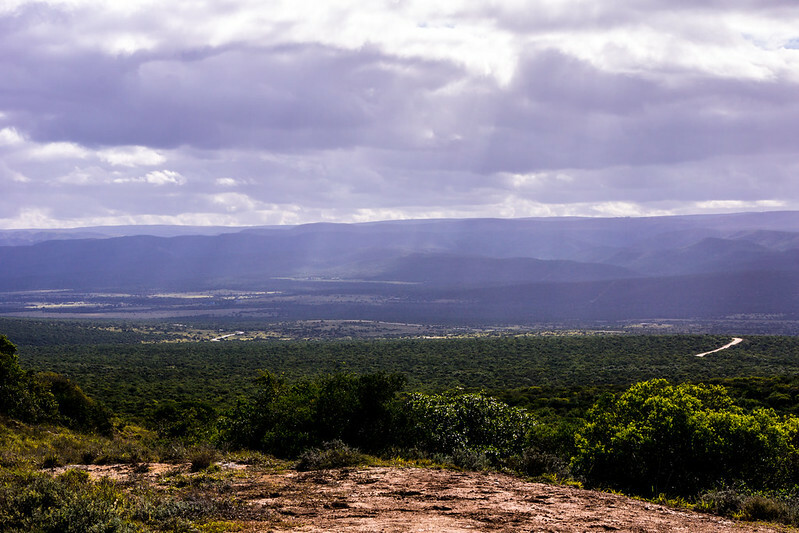 Doing a road trip in South Africa, now that I have done it myself, would be something that I would recommend to anyone looking for a little bit of adventure. The main highways (N) were generally in decent shape, the average driver was surprisingly courteous, and the police aren’t going to bother you unless you are obviously breaking a traffic law (or at least in the areas I was in). As with any country, it’s a good way to get a feel for the land that you can’t if you were on some organized tour on a bus or flying between two points. As much as I like flying places, driving across the southern portion of the country and continent was much more rewarding than having more time in Cape Town or Knysna or anywhere. As I said earlier, the road trip itself was more so the destination for me than Knysna or Cape Town or any of the places I stopped on the way. Of course I learned a few lessons, and if I come back here and rent a car again, I’ll be getting the “Tire and Windshield Waiver”. While Hertz never came after me for any additional money – either it was determined to be covered under one of the other waivers I had or that it had come out within the amount of the deposit they took of 2000 Rand (the guy who picked up my car had estimated that it might be 1500 Rand, if just a tire), trust me, you don’t want to be in a position to be be thinking for two hours on the side of the road about how much this might cost you. Trust me, it’s not fun! Of course my arrival in Cape Town was not exactly the end of my road journey! Since I had missed the Penguins on my last leg, I would back track the few hours on my full day in town to make sure that I got to check them out. That of course will be covered here shortly! 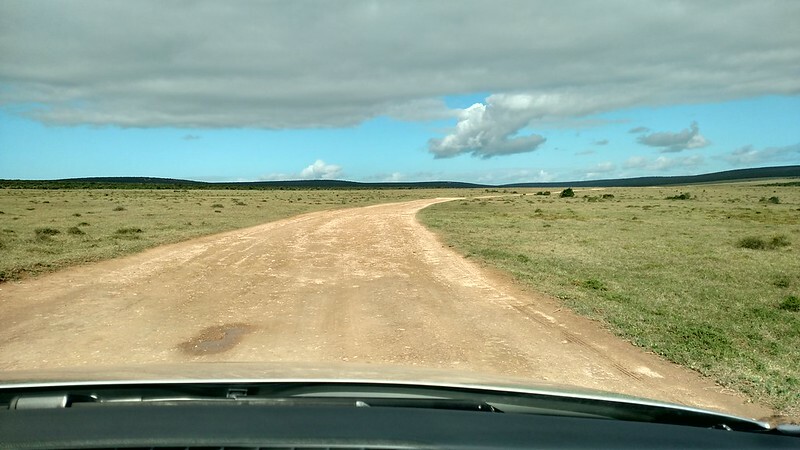 This entry was posted in Africa, Road Trip, RTW, South Africa, Travel, Trip Report. Bookmark the permalink. Follow any comments here with the RSS feed for this post. Post a comment or leave a trackback: Trackback URL.